Months ago it seems, Loree over at danger garden challenged her readers to do a before and after post on their gardens. Because I have no photo organization tool, it's taken me this long to find my old photos from 2008 and 2009 and take matching new ones. In fact, "matching" was all but impossible in some cases, due to the amount of vegetation we've planted, and the location of new trees and shrubs. But I did what I could to replicate the views. Here we go! Now: there are a lot of new plants along the front, but you can't see a lot of difference from this view. Do love the simplified entrance and the new paint job, though! Now: of course, big, deciduous trees change the look in summer. They have all grown a lot in the past five years. And you can hardly see the fence and retaining wall from this point. From the south then: roses, roses, roses, along the narrow hell strip. Now: the hell strip is looking much more interesting, with some remaining roses, but a number of drought-tolerant species introduced. Hard to see in this photo is the Malus 'Prairifire' on the strip. Along the south side then: can you spot the tiny Ceanothus 'Victoria' against the retaining wall? Then: we've moved into the back garden, looking northwest. Then: looking east after building the deck. This is a later picture, but before we made any garden changes. Now: it's pretty hard to even see the neighbor's house in summer - goal! Then: looking south, shortly after building the deck. Now: that remaining lawn is going, I promise you! Then: we're looking north from the narrow middle part of the back garden. You can see we were figuring out tree placement using upturned pots. Now: this is slightly further north, but there was a bed in my way. Then: looking northeast from near the same spot. Then: looking north-northeast near the back door of the house. Then: concrete ran along the east side of the house. Now: we got rid of most of the concrete. The new bed created to the south is our best morning-sun, afternoon-shade exposure. Then: "RV parking" along the north side of the garage. Now: about the same, but filled with amendments and garden treats. Every gardener needs a utility space, right? That's bamboo in containers along the driveway beyond the gate. Finally, one of our most dramatic change views. Then: looking south from the north fence. Now: Less opens space, but far more privacy. We enjoy dinner out here almost every evening. I hope you've enjoyed this little retrospective of the garden's progress. I look forward to doing another Then-and-Now five years hence, if I can get any perspective after the boskiness increases still further! I don't always manage to post for Foliage Follow-Up. 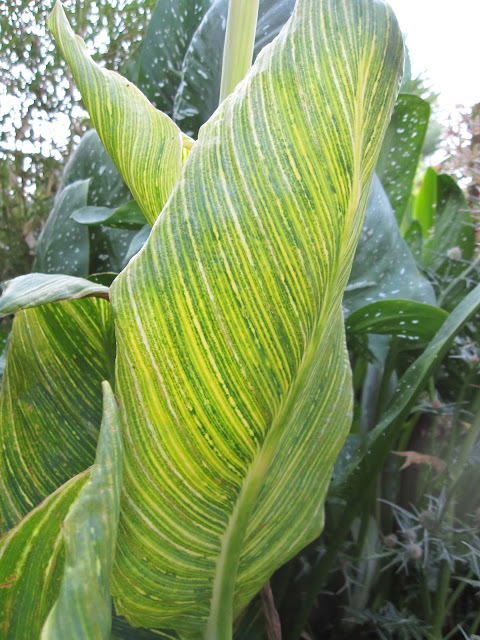 This month, I'm so delighted by some big, upright leaves in the garden I had to share them. 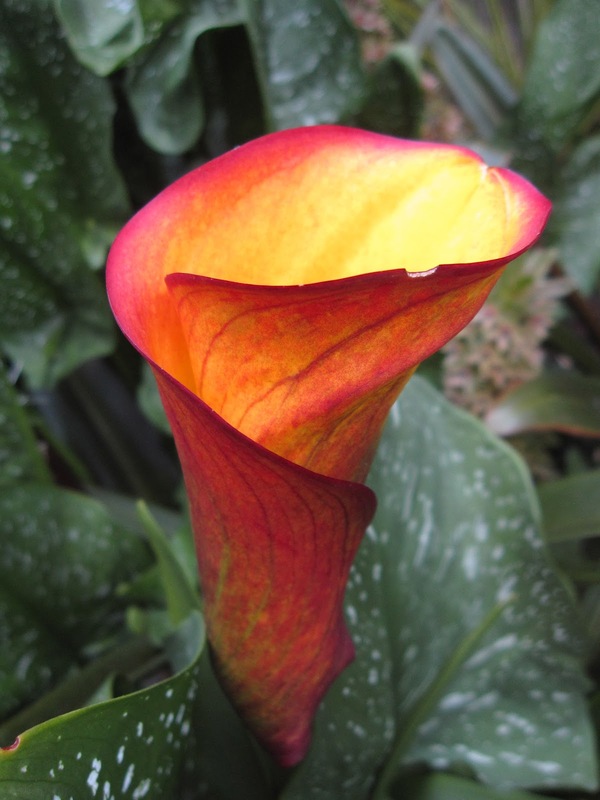 The leaves of Zantedeschia 'Flame" are as good as the flower. 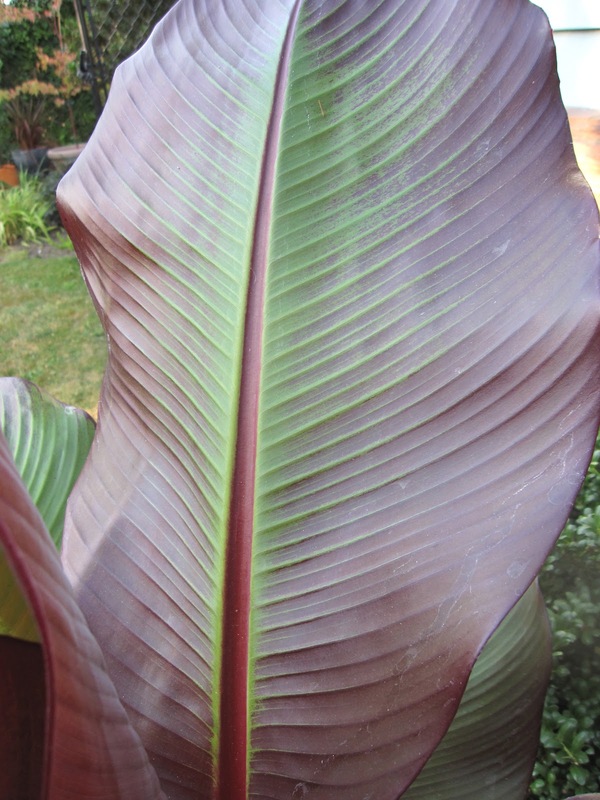 Ensete ventricosum 'Maurelii': these dark red leaves make it worth pulling the plant in fall and replanting in spring. Meliathus major 'Purple Haze'. When you touch or move the leaves, it's clear why its common name is Honey Bush. 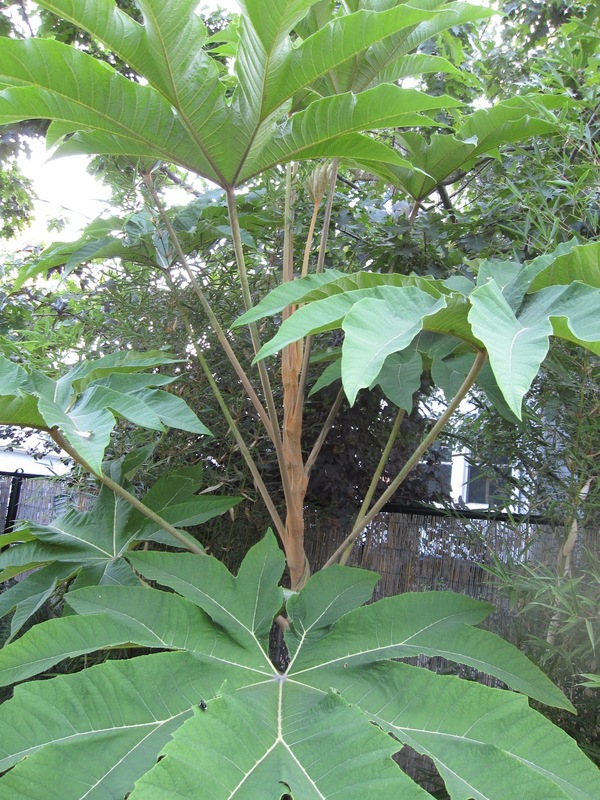 Tetrapanax paperifera 'Steroidal Giant'. The mild winter let this plant get an early start, and it's about eight feet tall now. 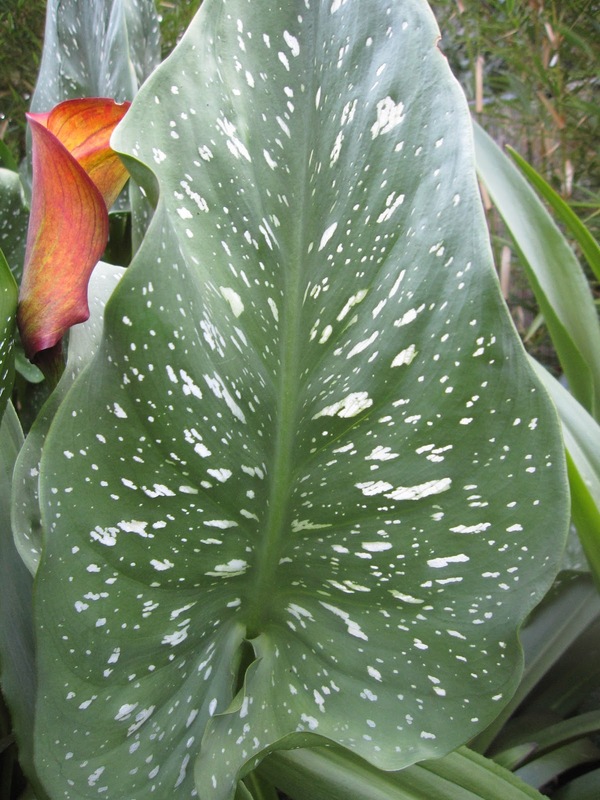 Can you see a little black dot near the center part of the edge of the lowest leaf? There he is, just waking up this morning. What a great place to camp out on a warm summer night! For more foliage fun, visit Pam, the host of Foliage Follow-Up at Digging. It's a sizzling Bloom Day here at Longview Ranch in Portland, Oregon. 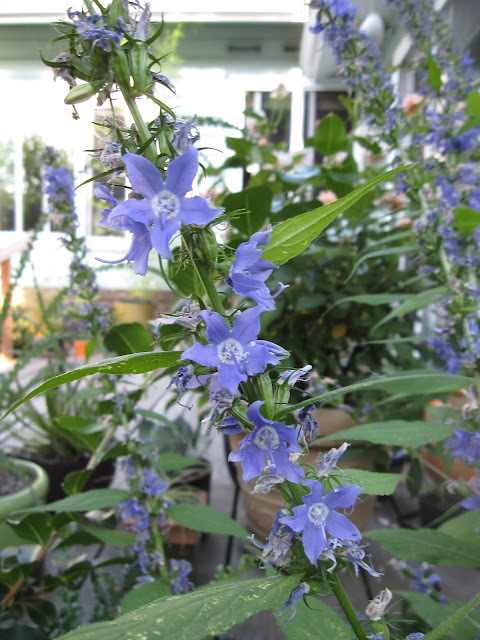 Some of us wait all year for this summer heat, so we naturally grow the high-summer bloomers that love it. Trachelospermum jasminiodes 'Confederate Cream'. Two plants in their fourth year are really established and disguising some of the fence now. And the scent is lovely. It seems as though I show this potentilla (P. fruiticosa 'McKay's White") every Bloom Day from May on, but at the risk of boring you, here it is, still blooming and looking great. Potentillas may be common and easily dismissed, but I love their fuzzy, grayish foliage and ongoing summer blooms. 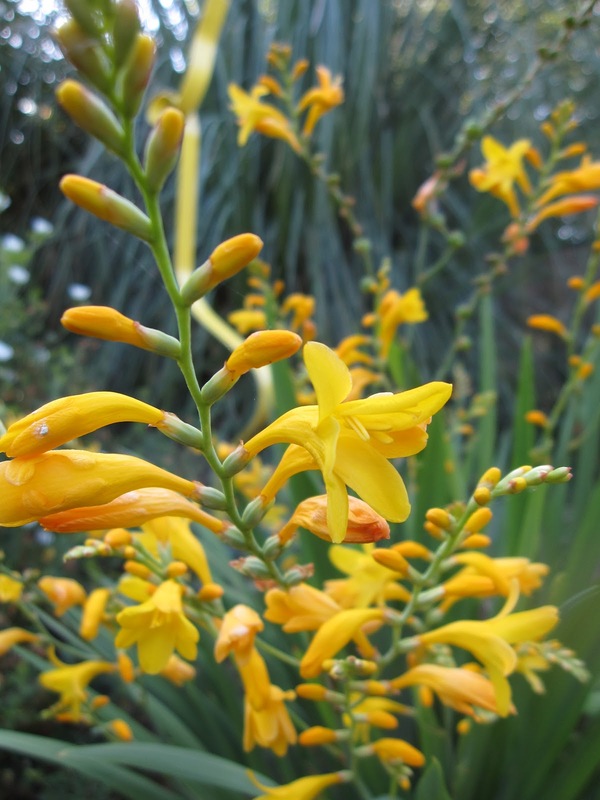 Crocosmia 'Citronella' (or 'Golden Fleece'), always the last crocosmia to bloom. It looks wonderful, backed by Helenium 'Moorheim Beauty' and Arctostaphylos x 'Austin Griffiths'. Here's a close-up of 'Moorheim Beauty'. As the blooms mature, the petals recurve almost like an Echinacea. The bees are still enjoying the color star of the garden - Agastache 'Acapulco Orange'. It's a big plant and I love its assertive presence in the garden. 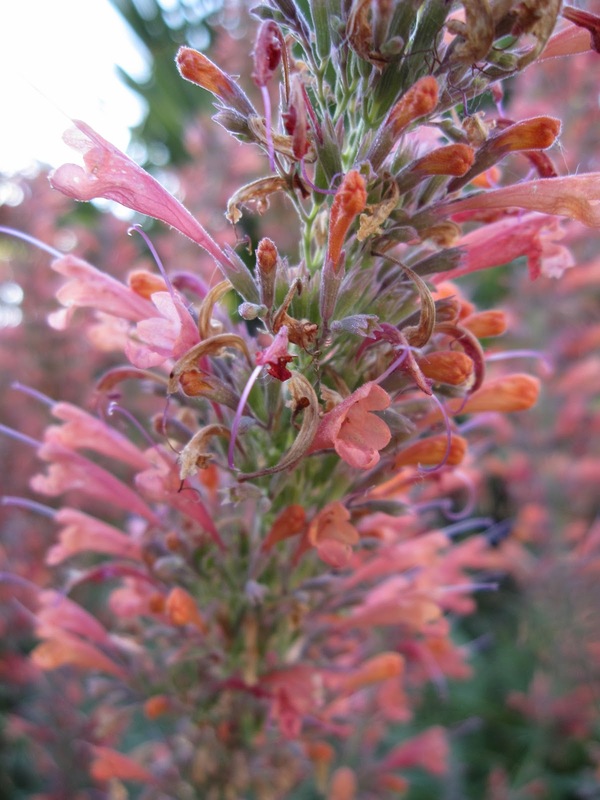 Agastache rupestris is smaller and its foliage is grayer, but it has the same great pinky-orange flower. Three Eucomis comosa 'Sparkling Burgundy' are blooming for the first time. 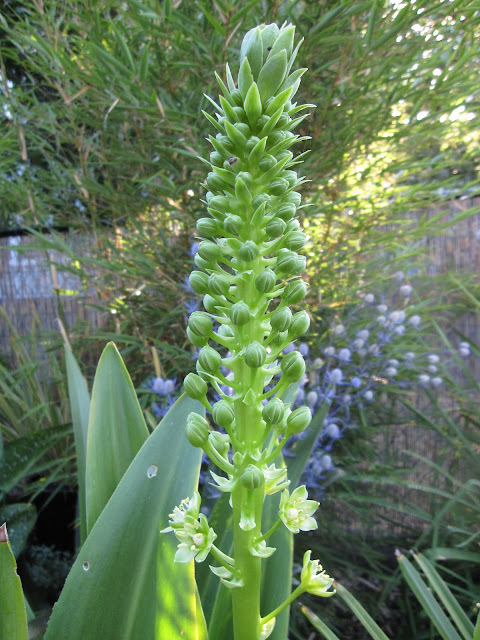 And the same one-of-three Eucomis pallidiflora ssp. pole evansii is also blooming again. 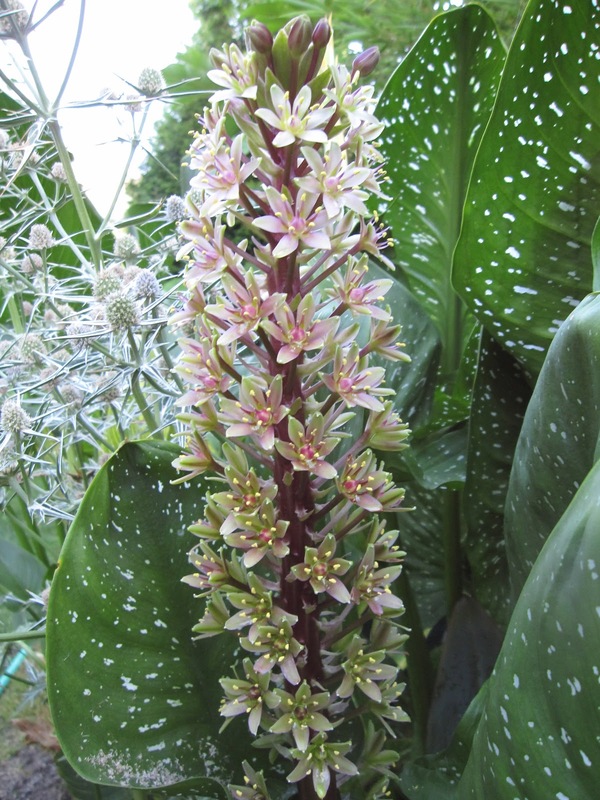 This giant pineapple lily is nearly four feet tall. 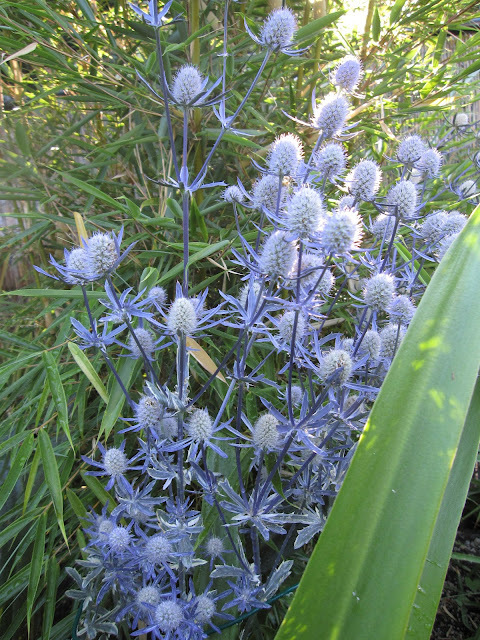 Eryngium 'Jade Frost' has such fabulous blue color. 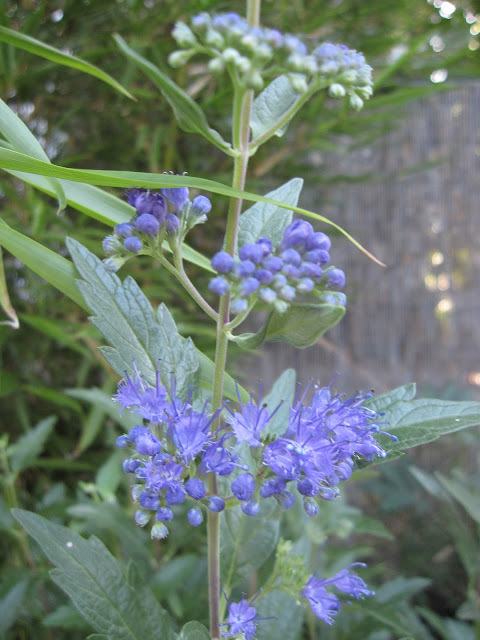 Caryopteris is a late bloomer each summer, but that blue is so welcome when it arrives. Campanula americana is past its prime, but still providing a nice hit of blue, too. A NOID Canna I grow for its foliage has decided to pop. Two summer-blooming heathers are doing their thing next to the Yucca rostrata. What is it? The beginnings of the first white flowers blooms on my Langerstroemia 'Natchez'. Although I picked it for its bark, I can't say I'd be sorry to have blooms. The flowers of Delosperma 'Oberg' are pretty challenging to capture: they won't open until the sun is on them and then the photo burns out. This is a weird in-between. Oberg is loving my hot hell strip. And last, a pretty purple Asian eggplant flower. I'm trying a new one this year: 'Ping Tung Long'. Sounds delicious, right? Carol of May Dreams Gardens hosts bloom Day every month on the 15th. 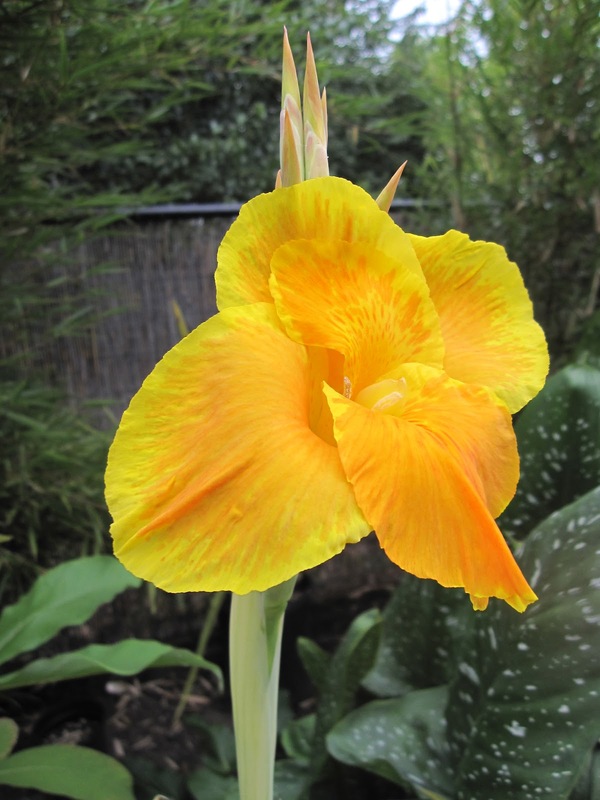 Check out more August flowers at her blog, where you can find links to more than a hundred garden bloggers' posts for today.